Get the latest looks with the latest slim-line Styling Brush from the professional Head Jog salon range, it's absolutely perfect for back combing, and creating the latest big styles. These fabulous hairbrushes feature nylon bristles which are ideal for grooming, sectioning and styling. This professional back combing brush is suitable for all hair lengths and types and has a lightweight feel with an ergonomically designed finger rest for comfort and ease of use. 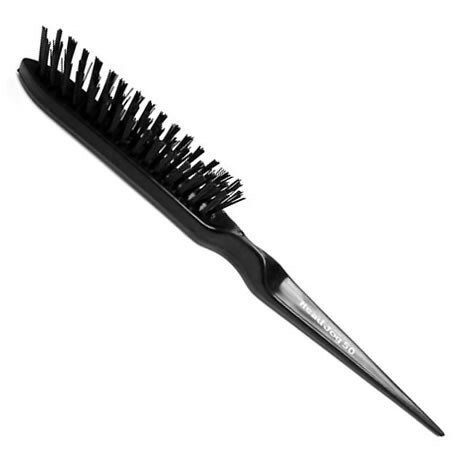 The handle of the brush is styled like a pick, allowing you to pull at hair and tease it into the desired style. The strong and rigid bristles are designed to back comb even the toughest hair, to create incredible volume, height and lift. Perfect for creating the latest big-hair styles quickly and easily, the HeadJog Back Comb brush is a superb piece of styling equipment.